If you ask us who needs a headlamp, our simple answer is everyone! As much as we love flashlights for their portability and convenience, the same is double for headlamps. Add in the fact that your hands are completely free to work and play, and a headlamp becomes a no-brainer for so many different situations. Aside from the obvious “no-hands-needed” factor of a headlamp, the other big difference between a flashlight and headlamp is the beam spread. 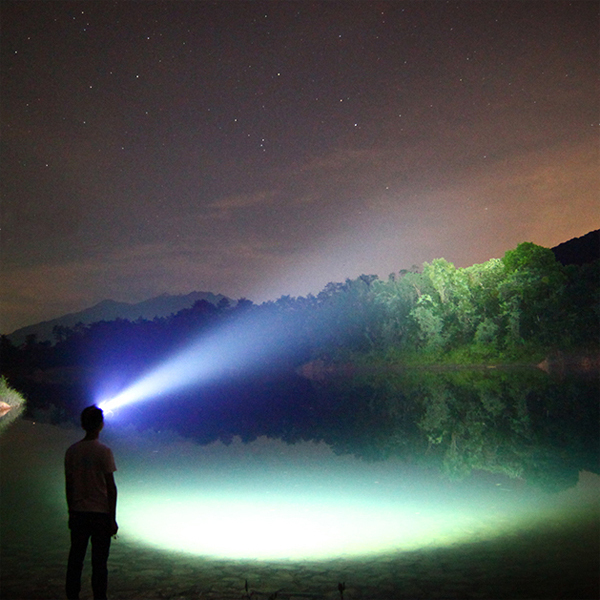 Flashlights tend to be optimized for throw distance and will have a focused hotspot. Headlamps, on the other hand, are designed to create a wide-angle beam that can evenly illuminate your immediate field of view. Of course this isn’t an exhaustive list. Tell us in the comments below how you use your headlamp! Let’s start with the most important feature of your headlamp: the output. It may seem obvious, but it’s vital to make sure your headlamp is capable of doing what you need it to do! In general, the brighter your headlamp is, the larger battery solution it will require which will cause an increase in overall size and weight. As you shop around, you’ll probably notice that most headlamps come in two major categories: < 500 lumen max output and 1000+ lumen max output. Lower lumen headlamps like the NITECORE NU20 and NITECORE NU25 are great for everyday use and adding an extra boost of visibility in low light situations like modeling/crafting, cleaning dark corners, running, cycling and outdoor sports. If you’ll be in total darkness, need to illuminate larger spaces or have poor eyesight, consider a full-size headlamp capable of at least 1000 lumens. Headlamps like the NITECORE HC65 are a staple for industrial workers and back country explorers for their super bright output and long runtimes. For our brightest headlamp, you’ll want to check out the NITECORE HC33 1800 lumen headlamp. If brightness is the most important factor, the power solution for your headlamp comes in close second. Batteries account for a large portion of the weight and bulk of a headlamp, after all. Finding the sweet spot between size and battery life can be tricky, so let’s look at your options. You’ll find a variety of headlamps that use a removable battery to power the headlamp. These are a great option for extended and heavier users because you can carry a backup set of batteries to swap out and charge as needed. For single 18650 battery headlamps, you’ll frequently find the battery integrated into the body tube of the lamp like the NITECORE HC33 and NITECORE HC65. For headlamps that use a bulkier power solution like the NITECORE HC70, you’ll often see a battery pack solution that can be clipped to your belt or tucked in a bag. This keeps the headlamp mangeable while maintaining a powerful output with long runtimes. Although not a rule, the vast majority of headlamps with built-in batteries do so to keep the overall size and weight of the headlamp to a minimum. 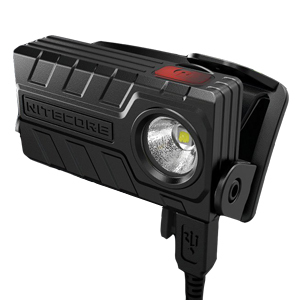 Headlamps with a built-in battery like the NITECORE NU20 strike the perfect balance between weight and output. In fact, many customers tell us the NU20 is so comfortable they can’t even tell they’re wearing it! The other advantage of built-in batteries on headlamp besides weight is the charging capability. All of our headlamps with built-in batteries include a micro-USB charging port for convenient charging at home and on the go. Okay, we’ve hinted at it strongly already, but we’re coming out and saying it now: buy the most compact headlamp that will suit your needs. If you’re going to be wearing your headlamp for any length of time, you’ll want something that’s comfortable. To get the most functionality out of your headlamp, consider headlamps with secondary LED options such as red and high CRI LEDs. Red outputs are a staple among hunters for their low detectability to hog, coyote and other varmints as well as photographers and campers for preserving night vision. High CRI outputs are becoming more popular and are a huge help for up close tasks. An LED with a high Color Index Rating (>90) mimics natural sunlight and is capable of rendering colors and details with a high degree of accuracy. The benefits are immediately noticeable and payoff huge for those who suffer from eye strain. If you’re going to be out in rain, sleet and snow, make sure you get a headlamp designed to withstand the elements. Some headlamps like the NU20 are fine for light splashing and rain, but won’t survive a full dunk in the lake. If there’s any chance of full submersion, look for headlamps with an IPX8 waterproof rating. 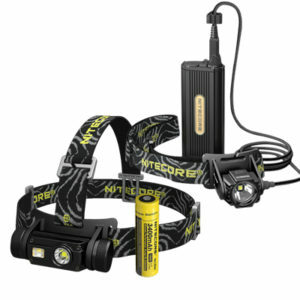 Our favorites include the NITECORE HC65 rechargeable headlamp and NITECORE HC60 rechargeable headlamp. Don’t settle for just a headlamp or a flashlight when you can have the convenience of both! L-angle headlamps combine the best of both worlds by quickly converting from a headlamp to a small, EDC size torch. Available in the NITECORE HC33 L-angle headlamp and NITECORE HC30 L-angle headlamp. Below is a side-by-side comparison of all our NITECORE headlamps so you can quickly compare models based on several key features. I use my NITECORE headlamps for many things but most often, and really twice daily during most of the year, to pick up dog stuff in my yard. I'm usually out there before the sun comes up and after the sun goes down. Also during the summer I'm looking for rattlesnakes as well. Found one a month or so ago that had somehow gotten through my "snake-resistant" fencing. Probably saved me a few thousand dollars in vet bills – thank you NITECORE!